The Derby di Milano is one of the most intense rivalries in the world, and the latest edition did anything but disappoint. 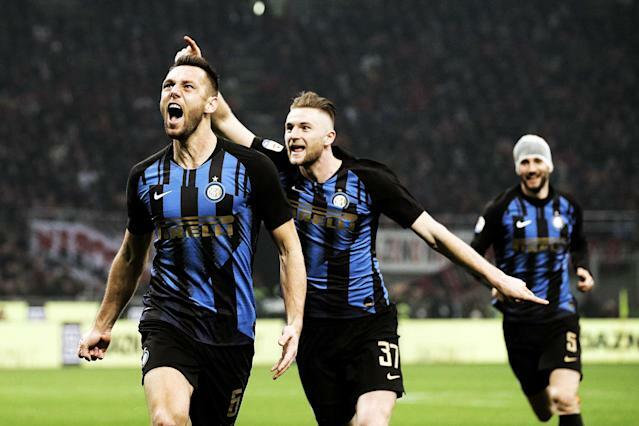 Inter Milan completed the Serie A double over AC Milan with a 3-2 win at the San Siro on Sunday, as Matías Vecino, Stefan de Vrij and Lautaro Martínez scored and Milan couldn’t find an equalizer in its second-half push. The win vaults Inter into third in the league table with 53 points, two ahead of fourth-place Milan’s 51. Inter won the first derby of the season 1-0 on a goal by Mauro Icardi in October. Icardi has been all but exiled from the squad since mid-February, when he was stripped of the captaincy amid contentious contract negotiations and refused to play in a Europa League match the following day. Inter has carried on just fine without him. Although they exited the Europa League in the round of 16 this week, they’ve lost just twice in nine matches across all competitions. Martínez, the 21-year-old Argentine who’s gotten the bulk of the starts and minutes in Icardi’s place, scored his sixth league goal of the season on a penalty in the 67th minute after Matteo Politano was brought down in the box. Mateo Musacchio cut the lead with a goal in the 71st minute, but that was it for Milan. The cleanest look on goal came in the waning minutes as Patrick Cutrone fired near-post but Inter defender Danilo D’Ambrosio was there to block it cleanly. 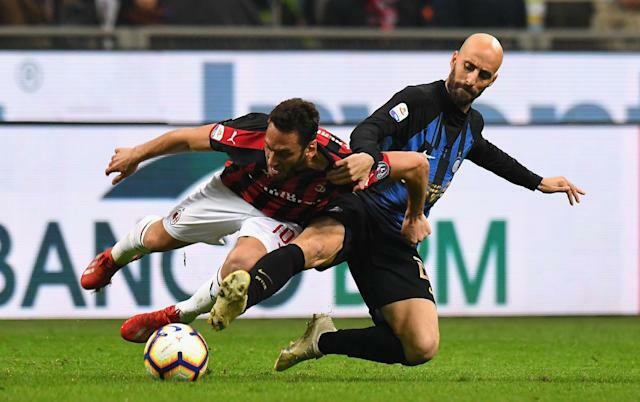 Andrea Conti was initially red-carded for a reckless challenge on Martínez right before stoppage time, and he slid with his lead leg up and studs showing. But VAR ruled Conti’s trail leg is what tripped Martínez and he was allowed to finish the game. In all, the teams combined for 31 fouls in a characteristically intense affair. The result will be a disappointment to Milan, but manager Gennaro Gattuso has the club in prime position to qualify for the Champions League for the first time since 2014. Appointed 16 months ago, Gattuso has survived an ownership change in April of last year, when United States-based hedge fund Elliott Management purchased Milan from Chinese owner Yonghong Li, and steered the club back in the direction of lofty expectations Gattuso himself helped set during a successful career as a Milan player. Champions League qualification would go a long way toward resolving Milan’s financial issues, which would be a big win in and of itself. But for now, the bragging rights are reserved for Inter.